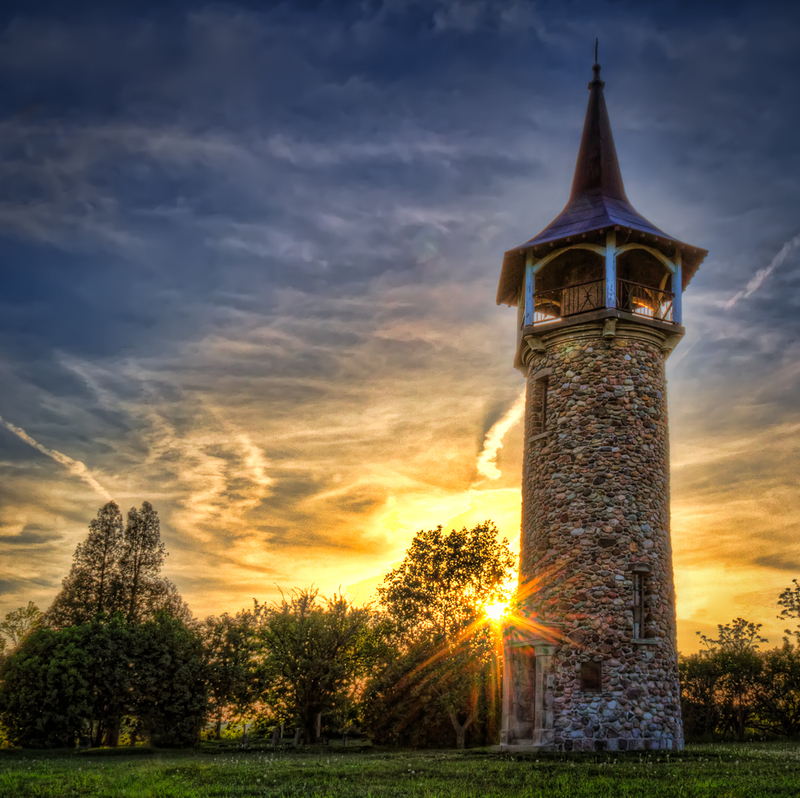 In anticipation of a nice sunset last night we headed out to the Pioneer Tower in Kitchener. I have never visited this site before and it is a beautiful area with lots of walking trials. The sunset was pretty good and this is one of the shots I took. The following is a description of the tower from An Insider’s Guide to Waterloo Region. Kitchener’s Pioneer Tower is a frequently photographed landmark. The tower was completed in 1926 to celebrate the German origins of the region, particularly to memorialize the Pennsylvania Dutch and Mennonite settlers who settled here in the early 1800′s. The city of Berlin, Ontario was renamed Kitchener during World War 1 and this tower was built in an effort to heal nationalistic wounds. The architecture is Swiss in influence, as Switzerland is the ancestral home of some Mennonite families in the area. The tower is often open and the steep steel steps lead to an upper balcony which offers a wide panoramic view of the Grand River and surrounding countryside. At the edge of the bluff is a small pioneer cemetery where members of the Sherk and Betzner families are buried. The Schoerg (Sherk) and Betzner homesteads are nearby and the farmhouses built around 1830 still stand. A small park with some playground equipment is adjacent to the tower. The picture above was taken on a summer evening. Sunrise and sunset light are friends of any photographer who may want to take an exceptional picture of this landmark.